The Nolan’s, who originally formed in 1974 as The Nolan Sisters, are an Irish/British girl group, famous for uptempo covers of well known songs. In their own right, they are most famous for I’m In The Mood For Dancing, which when released in 1979, topped the charts around the world, and to this day, remains one of the most famous disco songs of the era. The sisters, Anne, Denise, Maureen, Linda and Bernie, became regular favourites, appearing on many weekly prime-time shows, including The Two Ronnies. Family feuds, ill health and the death of Bernie, put a stop to their act in the 2000′s but the band reformed again in 2009, but stopped performing again by 2014. 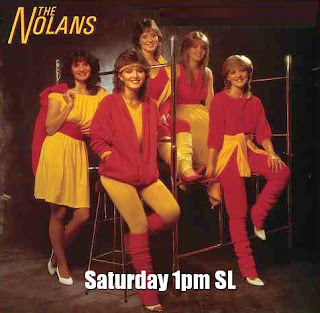 Enjoy this show on Saturday at 12pm SL time (8pm UK), featuring all the Nolan’s at the height of their popularity, with special guest, Kim Woodburn, who recently appeared quite demented along side Coleen Nolan on multiple shows!